In fiscal year 2016, the government of the State of Vermont spent more than $5.6 billion to run the state. Where that money was spent and where it came from is outlined below. Each year, Vermont does a Comprehensive Annual Financial Report (“CAFR”) prepared and audited by KPMG, one of the big four accounting firms. This report provides an independent and detailed assessment of the state’s expenses, revenues, assets and liabilities using consistent accounting standards. The information below is based on the CAFR for the fiscal year ended June 30, 2016. Most of the public discussion of spending and taxation focuses on the annual budget hammered out between the governor and the legislature. Budgets are based on assumptions and estimates, many or which turn out not to be accurate (typically, revenues are overestimated and expenses are underestimated). The Informed Vermonter strongly prefers the annual independently audited financial report of the state, which is both factual and highly detailed. It would appear that Vermont had a surplus of $257.4 million in 2016, but this is not the case. The chart above is an income statement and a) does not include some major cash items that run through the balance sheet, and b) includes some major non-cash “accounting” expenses. First, the expenditures above include $164.1 million of depreciation expense, the annual non-cash write down of capital assets (bridges, buildings, highways…) reflecting their shorter remaining useful lives. On a cash basis, expenses are therefore overstated by $164.1 million. Also, capital expenditures are not included. In 2016, the state spent $257.4 million on new buildings, bridges, equipment and roads. These capital expenditures need to be added to the expenditures of the state. Debt repayment and new debt issuance is also not included . In 2016, the state’s net debt increased by $40.3 million and this is not included in the Revenues outlined above. Last, investment in working capital, which is cash in the bank plus short- term receivables less short-term payables, is also not included. These accounts reflect revenues that have been booked but not yet received and expenses incurred but not yet paid. In 2016, the states net working capital increased by $147.9 million. 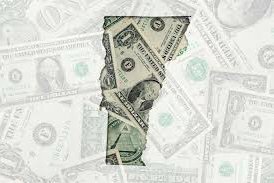 Most of the state’s departments make some level of recurring service revenues through various fees, levies and charges. Some of the larger contributors are unemployment insurance premiums ($143.5mm), the lottery ($124.3mm), liquor control ($60.4mm), vehicle registration and license fees ($62.4mm) and a wide variety of fees collected by the Agency for Protection to Persons and Property ($168.9mm). Federal grants, at just over $2 billion, represent 34.6% of total state revenues. Vermont’s destiny does not really lie in its own hands. Any material reduction in Federal grants would make it very challenging for Vermont to balance its books. Note that the level of federal grants has been declining over the last five years under President Obama. Our new president plans to reduce this much further. As part of the state’s annual audit process, the Federal Single Audit report is prepared. This report outlines every federal grant received by the state and makes interesting reading. Other taxes, at $620.5 million, include tobacco, gasoline, diesel, purchase & use, taxes on health care providers under Obamacare, insurance taxes and inheritance tax. Two departments, Education and Human Services (health care & welfare) account for 77% of total state expenditures. The growth in their expenditures over the last five years was a staggering $863.8 million. Any real effort to reduce state expenditures and cut taxes must address the cost of these two departments. After many consecutive years of growing government expenditures, it was encouraging that the state managed to keep expenditures flat in fiscal year 2016. Six departments, including Human Services, cut their annual expense burden. Next articleRevenue and Expenditures: 2. What Are Vermont Taxpayers Really Paying For? What is the “Agency for Protection to Persons and Property”? I am not aware that this is a standalone entity of Vermont’s state government. Attorney General and States Attorney’s, State Police, Secretary of State, all regulators (banks, insurance, utilities etc) and the National Guard.